Shirts With Random Triangles: Oklahoma State freshman RB Devon Thomas accused of armed robbery. Oklahoma State freshman RB Devon Thomas accused of armed robbery. Devon Thomas's mugshot. Via KTUL. 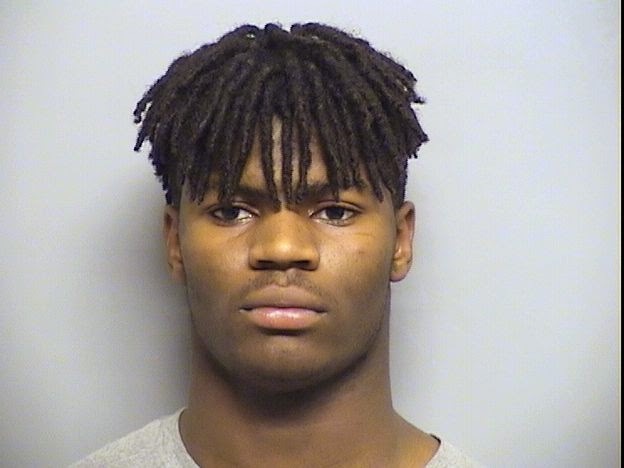 Oklahoma State freshman running back Devon Thomas is facing charges of armed robbery and shooting with intent to kill following an incident in his hometown of Broken Arrow, Ok.
Thomas and three other individuals are accused of being involved in an attempted robbery on Tuesday, May, 28. The male victim claims the Thomas and his associates "stole his marijuana, money, shoes and clothing" then threatened to shoot him if he didn't leave. The victim identified four suspects, telling police he has known them for several years, and said Thomas was the suspect carrying the gun. The four -- Thomas, 18-year-olds Eduard Smith and De'Carrio Taylor, and 17-year-old juveniles, all of Broken Arrow -- were arrested Wednesday at various locations in the city. At last report, Thomas was being held on $125,000 bond at the Tulsa County Jail. Oklahoma State has yet to comment on the incident.